Commercial real estate activity in Calgary, driven by the office market, was up in the first quarter of 2017. 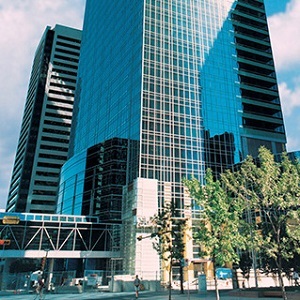 The TransCanada Tower in Calgary. A report from Altus Group’s Data Solutions showed the number of deals increased by 32 per cent over the previous three-month period and the dollar value edged over the $1-billion mark for the second time in two years. There were 14 office transactions worth $481 million in the quarter, accounting for 46 per cent of the total dollar volume. That’s up significantly from $55 million in the fourth quarter of 2016 and just $7.4 million a year earlier. The increase was driven by the Healthcare of Ontario Pension Plan’s (HOOPP) 50 per cent acquisition of the 38-storey, 931,187-square-foot, class-A TransCanada Tower from H&R REIT (HR.UN-T) for $257.37 million. Slate Asset Management utilized its new Slate Canadian Real Estate Opportunities Fund to acquire 12 office buildings from Dream Office REIT (D.UN-T), via six transactions, for $200 million. “Portfolio and larger individual property transactions are an indication of confidence in the market, however they represent an overarching influence on the total numbers and mask the more tepid underlying market performance,” Data Solutions director Paul Richter said in the report. The industrial sector captured 21 per cent of the sales transaction value. There were 37 transactions worth $215 million, up 40 per cent from the fourth quarter and double Q1 2016. The biggest deal involved the 225,160-square-foot Burns Industrial Park, which was purchased by Burns LC Ltd. for $19 million from SMI Holdings Ltd. There were 18 residential land transactions totalling $105 million, which was up 41 per cent from the previous quarter and 57 per cent from a year earlier. There were 19 retail transactions valued at $80 million. That was 45 per cent lower than in the last quarter and 37 per cent lower than in the first quarter of 2016. The Great West Life Real Estate Fund’s $24.4-million purchase of the Creekside Crossing mall from 718721 Alberta Ltd. was the biggest transaction. The apartment sector recorded nine transactions worth $30 million, mirroring the previous quarter’s results but down 72 per cent from the first quarter of 2016. Killiam Apartment REIT (KMP.UN-T) acquired Spruce Grove Lane, comprised of 66 townhouse-style apartments on a three-acre site in the Pump Hill neighbourhood, for $12.8 million. There were 43 industrial, commercial and investment land transactions worth $103 million, down 20 per cent from the fourth quarter but up four per cent from Q1 2016. The Hilton Garden Inn Calgary Airport was acquired by 1984463 Alberta Ltd. for $20.25 million from Goldencare Holdings Ltd.